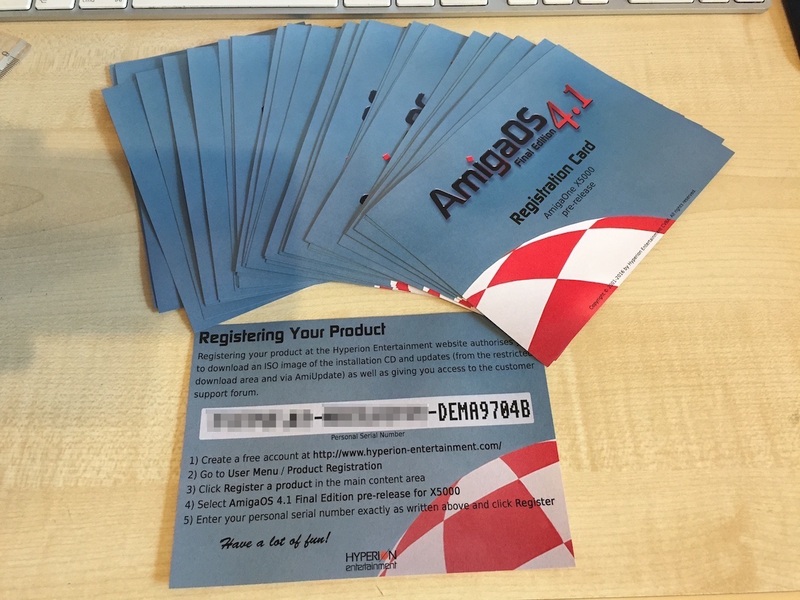 Posted by Costel Mincea on August 3, 2017 Comments Off on AmigaOS merchandising shop now open! And if you check out the fps counter you’ll notice that it runs pretty fast, actually quite a lot faster than on a sam460ex (of course on an X1000 or X5000 it runs much faster than on both, often above 100 fps). Addendum: The “normal” Tower57 FPU build works too on the Tabor btw. In that case, as with all other FPU-using programs, the OS’ current compatibility backend kicks in and “translates” each and every FPU-opcode into something the Tabor likes. Interesting enough: even then the Tabor is so powerful that it’s still playable (about 20fps where the sam460 reaches about 30fps). Posted by Costel Mincea on November 23, 2016 Comments Off on The universe is expanding! AmiWest 2016 (October 7 to 9) is fast approaching and so is Amiga DevCon 2016 (October 6 and 7). The location is Sacramento, California, USA. Please note, as always, the DevCon is a 100% volunteer effort as is the AmiWest show itself. A detailed tour of AmigaOS 4 with tutorials. We will be going through the Amiga Future programming articles by Michael Christoph. If you’d like to get a jump on them see the Amiga Future Programming Articles. The anatomy of an Amiga disk device driver. We will be dissecting the p5020sata.device which is a SATA device driver used in the upcoming AmigaOne X5000. This isn’t just any custom made driver. It is melding between Linux libata and the traditional AmigaOS trackdisk device drivers. Hans de Ruiter will be presenting his tutorials on Warp3D Nova. For anyone that wants to program for Warp3D Nova be sure to obtain/borrow/steal a card for the DevCon. See the Warp3D Nova press release for assistance on choosing a card. Personal Projects. You are encouraged to bring your own personal projects to the DevCon where we, as a group, may be able to help you out. The AmigaOS Fast File System (FFS) was created back in 1988 and, believe it or not, is still in use today by some die hard enthusiasts who insist it is still pretty good. FFS has several modes which has enabled it to survive far past its expiry date. Two of those modes have never been described before. That is about to change. Back in 1992, Randell Jesup added what is known as the Directory Caching File System (DCFS) mode to FFS. This was meant to speed up directory listings on floppy disks. A rarely used and mysterious mode with very little documentation. Fast forward to 2001 when Olaf Barthel created a FFS reimplementation and added the Long Name File System (LNFS) mode. Up until this point users were stuck with 30 characters due to the original implementation. Curious? 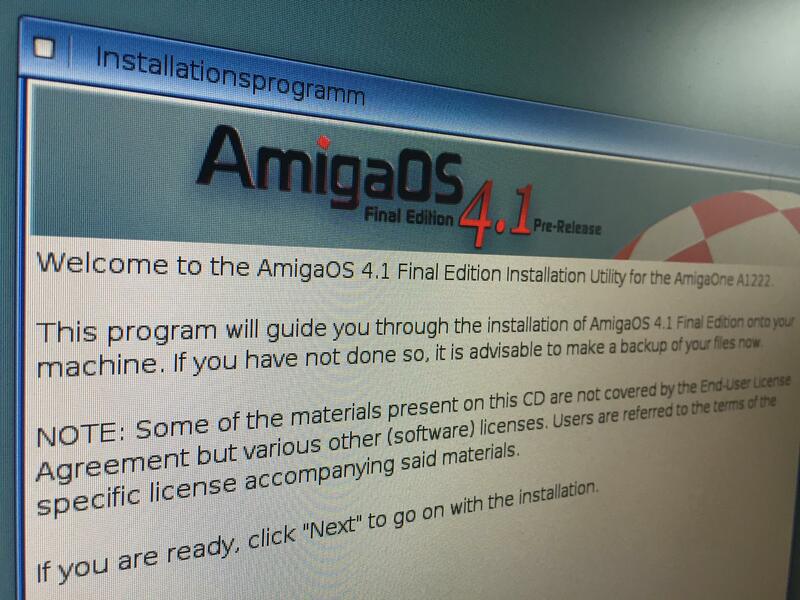 Read all the gory details on the most complete and official AmigaOS Documentation Wiki. The 68K assembler version of the console had a peculiar architecture. When the console was opened, it allocated display memory 50% bigger than the size of the window (in those days the console had to be passed the address of an existing window when you opened it). That memory was divided up into a character map, Width by Height bytes, and a similar sized array of character attributes. The addressing of the array was really strange and I think it might have been translated into 68K assembler from BCPL. As I mentioned last time, the fixed array size made it impossible to add history features to the architecture. Also, any operation such as an insertion, deletion, window resize or refresh was implemented by unpacking the whole character map and repacking it again. It was designed for a particular architecture and was not adaptable. We decided to use a linked list for the display rows, so that rows could be added or deleted at any time without having to repack a large array. The rows were then allocated and returned to a memory Pool for speed. The independence of the rows made it easy to keep a few pointers to the list, such as “History Start”, “Display Start”, “Display End” and “History End”. Most list operations were simplified by this approach and scrolling speed seemed to be adequate. The old console window was opened by the con-handler and its address passed to the console device. That meant that one program (the con-handler) opened and “owned” the window, but another (the console device) performed all the work on it. That had to change if we were ever going to support memory protection. In any case, it made sense that the program that used the window, opened and closed it also. One of the first changes was that the console device would from now on open and maintain its own window (of course, it still had to accept the address of an existing window passed to it by an old program). Once the console could open its own window, it could make it a ReAction window with Iconify, Scroll and ClickTab gadgets. If it was passed the address of an existing window, then none of the “extras” could be added since the calling program might have added its own extras, so only “new-style” windows have all the extra gadgets. Now you no longer have to close the Shell when you change Workbench GUI settings! Most of the gadgets can be independently enabled or disabled by options in the Shell tooltypes. One feature of the old design was that a long row could overlap the edge of the display window and “wrap around” onto the next row. You’ve all seen what happens when you make a Shell window narrower – the long rows split into two or more and the text occupies more rows on the screen. To implement this feature with the linked list, we ended up creating “multiple rows” that consisted of two or more rows of text on the screen, but linked, each one to the others on each side. What is more, the new console display had to be able to scroll text on and off top and bottom of the window. The window might even have been resized since the old text was scrolled off the edge, so we had to accommodate changes in window width as old rows of text were scrolled back into view. A lot of work has gone into the treatment of “long lines”! The current history, consisting of the contents of the linked list of lines, is stored in RAM. In order to save memory, we allow old history to be written out to a disk file once the number of lines of stored text reaches a predetermined limit. You can specify how many lines of text you want to keep in RAM, and what to do once that overflows (e.g. keep it in a disk file or discard it). You can also elect to save the whole Shell session to a file if you wish. Scrolling the history is easy, you can use the mouse wheel, the scroll bar gadget or built-in keystrokes. If you have selected to write old history to backup files when the current buffer is full, you can even scroll back through the history that has been written to the file. As you do, that history is read back into the current buffer, making it exceed the size limit temporarily. If you like, you can display the number of lines of history in the window title. Adding a ClickTab gadget to the window makes it possible to switch the display between any one of two or more actual Shells. All Shells share the same window geometry and gadgets, but each has its own independent history and text attributes. You could have one Shell displayed in black on white, another in white on black and others in any combinations you like. When you switch from one Shell to another, the new one is displayed in its own colours and style. You can choose the text to be shown on each tab (you might like to have the current directory, for instance). From one Shell, you can open a new one by selecting a menu item or a built-in keystroke. The new Shell is a clone of the previous one, that is, it “has” the same current directory, local variables, and so on. However, it is opened using the same “Shell-Startup” file as all the other Shells, so if your Shell-Startup file includes a line like “cd RAM:”, all new Shells will open with RAM: as the current directory. You can close any Shell individually, or even all at once. The menu accumulates all the key short-cuts (apart from those for command-line editing) and lets you select or edit settings as you wish. You can also call up the console Help file from the window. The Help file contains all the user documentation for the Shell, the con-handler and the console device. Most of the menu operations can also be performed by built-in keystrokes. 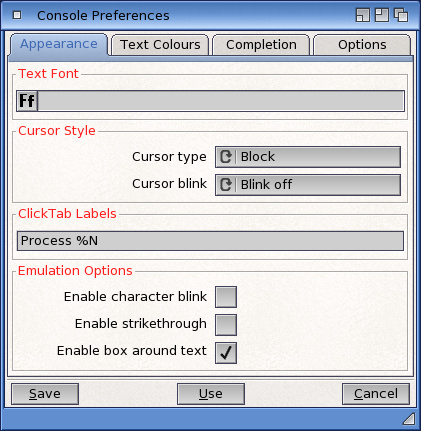 There is a Preferences Editor for the console settings. These are the default settings for the console and can be changed by the tooltypes in the Shell icon or the program running in the Shell window. You can also call the prefs editor from within the console window and “Use” the changes temporarily if you wish. You can select the font for the console text (fixed-width fonts only). You can also choose from a plain old “block” cursor, an underline or a vertical bar. You can make the cursor blink if you like. The “old” console was pretty restricted in its choice of text and background colours. You could use the ANSI escape sequences to set colours, but you could only choose from the system Pens. In the new console, we have introduced a palette of colours from which you can choose your text foreground and background colours. There are four palettes available to the user – you can select your preferred palette from the Preferences editor. The four palettes are the old System Pens, an ANSI set of primary colours, an ANSI set of “faint” colours and a “user” set which you can choose to your own preferences. The new console supports a few new text attributes, like italics, strike-through and character blink. Italics are spaced out slightly so that they don’t overlap with non-italic characters. The console does not attempt to support proportional fonts. Name completion strictly is a function of the con-handler, not the console, but it appears in the console window. You can now choose to have name-completion choices displayed in a “popup” window close to where you are typing. You can then choose from the displayed list. If you choose to see completion “in-line”, you can choose if or when you want the system to beep at you (if there are no matches, multiple matches, or “this is the last match”). Another con-handler setting in the console prefs is the size of the command input buffer. The old console was fixed at 1024 characters, but now you can leave it at 16 kB or set it to anything up to 1 MB. You can also change the default Tab spacing (Horizontal Tabs, not ClickTab) from its default eight spaces to two, or eleven, or any value between two and sixteen. The new console works in either its “legacy” style or its “new” style, depending on how it is opened. While testing it, we have discovered several older applications that depended on unspecified console behaviour or even, in some cases, bugs in the old console. We have tried to keep the new console compatible with the old, but inevitably there will be programs “out there” that will behave differently. Let us know and we will see what we can do. New applications can use the newer console features and make the most of them. All the above description is user information, of course. The AmigaOS SDK contains the full documentation of the new console API. 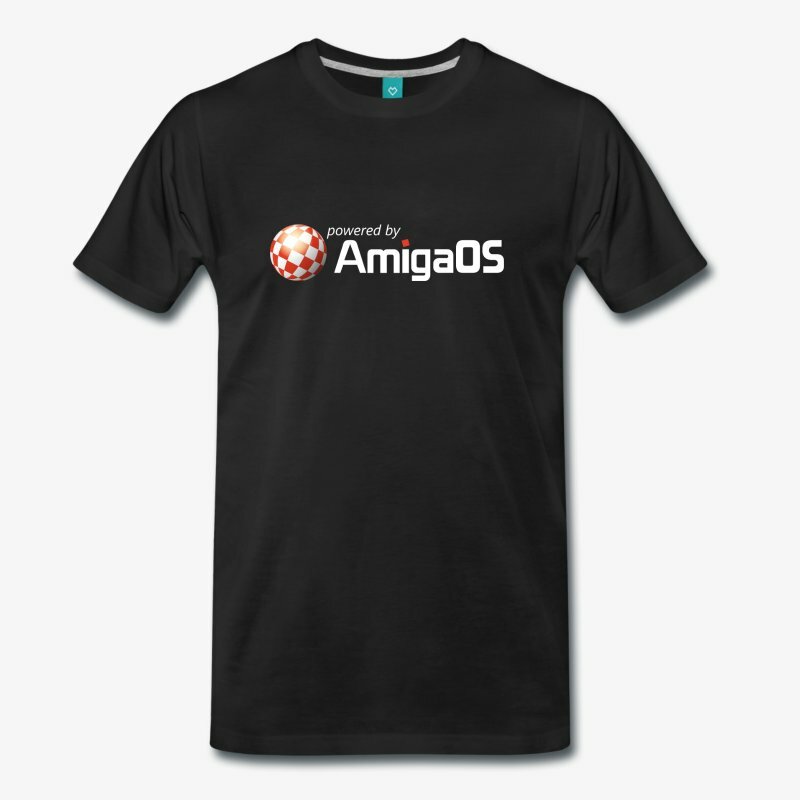 The AmigaOS Documentation Wiki has also been updated with new information about the improved Shell. Well, that’s it for now. I hope you enjoy the benefits of the new Shell. Early in 2004 I was invited to become a beta tester and had the good fortune to be able to run the 68K version of AmigaOS 4 on my A4000. 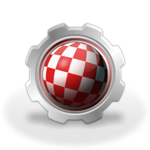 At that stage most of the old AmigaOS software had been modified (where necessary) to compile with GCC, and the developers were mainly using cross-compilers running under Linux or Windows. Many of the system components, originally written in 68K assembler, had already been rewritten in C or translated to C. Only a couple of months later, the first PPC versions of the system components were released to beta testers and 68K versions were dropped, one by one. Only a handful of third-party components remained in 68K, those for which we had binary licenses only (e.g. ARexx). During a discussion on the beta tester mailing list one day, one of the developers mentioned that only the console device remained to be translated/rewritten in C. Foolishly I waved my hand in the air and said something like “I’d like to have a go at that!”. Well, I had been an assembly-language programmer for probably thirty years and a C programmer for probably twenty, so I thought it might be fun. You can imagine my excitement when, some weeks later, an archive arrived in my inbox. It was the assembler sources for the console device, all 26 source files and about half a dozen header files. Where was I going to start? I couldn’t just translate the whole thing in one pass, then sit down and attempt to debug it. I had to be able to switch back and forth between assembler originals and C translations, or I would never be able to even make it run, let alone debug it. I decided to use SAS/C, the 68K compiler/assembler package that I had been using for years. Like many other packages, it allows you to mix C and assembler modules freely in the build. I could translate each assembler source file in turn, and with some stubs, call the assembler functions from C or the C functions from assembler. That way I would be able to switch individual modules back and forth between C and assembler at any time. I started by compiling the source on my trusty old A4000, since the A1-XE was by now the beta test machine and the A4000 was the stable development platform. Later, the native AmigaOS 4 version of GCC was released and I was able to compile and build on the A1-XE (it was a bit faster than the A4000, even with its 68060/50 processor!). Well, the translating job took about nine months. I took each assembler source file and commented out the assembler statements, writing in the C version underneath. Of course, this approach made each source file huge, but it would prove to be a boon later when I was debugging, since I could see the original side by side with my translation. During that time I had to break up some of the assembler source files into smaller modules, just to keep them a reasonable size. I finished up with some 30 C source files. You can see that the original five lines of assembler have become two lines of C.
The makefile was huge, with half of it commented out at any one time. The SAS/C suite produced 68K code, but from a mixture of C and assembler sources. At first it was all compiled on the A4000, but later I swung everything over to the A1-XE and made that my new development platform. As the development progressed, there were fewer assembler sources and more C sources, until the first pure-C version was released to the beta testers in May 2005. That version was still compiled by SAS/C and distributed as a 68K binary. There were several more months of debugging and testing, until the pure C sources were compiled into native PPC for the first time in August 2005. At about the same time, the C sources were stripped of the original assembler code and we had a working console device, written in C and compiled in pure PPC. We tested it to destruction and cleared the bugs before it was finally released to the world. Most of the bugs were inconsistencies with the old 68K version, caused by mis-translation or errors in understanding. It had taken a year to translate and debug, but it was a great satisfaction. The original 68K assembler version of the console occupied 16,212 bytes. Compare that with the last 68K C version (V50.26) which was 42,564 bytes! It just shows how squashed the assembler version was (but that C version did have some debug code as well). The translated console had several drawbacks. Because the original had been written in assembler, it was very difficult to read and maintain and there were a number of known “features” that were just too hard to fix. Also, the assembler version had been written to minimise code size, rather than to optimise speed or code legibility. There were many tricks employed within the assembler code to save a few bytes of space in the Kickstart ROM. For instance, it was common to arrange several byte-sized variables adjacently in the data area so that four variables could be picked up at once with a long word fetch. Not recognising these tricks was the cause of many a bug in the early days! Also a lot of the ANSI code had been not implemented in order to save space. Not the least of the drawbacks was that the memory allocated for the display was fixed when the window was opened, and lines of text that scrolled off the top or bottom of the display were scrubbed clean and re-introduced at the other end. It was just not possible to save the scrolled lines to keep the display history. To add a scroll bar and history would need a big rethink of the architecture. Next time: the Great Console Rewrite. This is a significant update to the SDK which will require a lot of developer support to use properly. New articles have already began to appear on the AmigaOS Development Wiki like Intuition’s new Menu Class article. We are also planning tutorials and a workshop at the Amiga DevCon 2015 which is before the AmiWest 2015 show in Sacramento, California, USA starting October 15th.